I brought my Grade 1 tree home like I was carrying Excalibur. I was so proud of my little sapling and couldn't wait to get it in the ground. My parents allowed me to dig far too large a hole in our newly landscaped back yard, leaving lots of room for the eventual Jack-and-the-Beanstalk-esque, horizon-dominating, monster tree I was sure to have by the end of summer. I remember showing off my tree proudly to every one of my parents' house guests as I and my tree grew up. 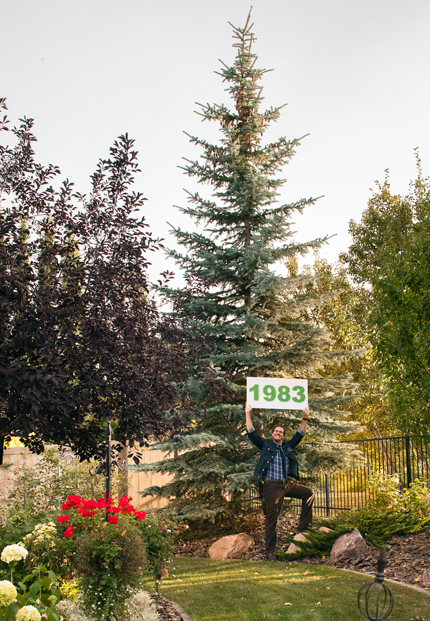 Seemingly overnight, the tree was taller than me; a monumental event as I was in the midst of my own early growth spurt. My tree continued to grow healthy and strong for years, needing to be relocated twice as it took over more and more of our yard. The big scare happened when my parents moved to their new home in 2001, after I had graduated University and moved to Toronto for work. They weren't willing to leave my tree behind, but it had grown in place for many years and we weren't sure it would survive being torn out and moved. But I am happy to say that my tree did survive the move and lives very happily overlooking the Mactaggart ravine, growing strong, and towering over almost every other tree in sight. On a side note, while my younger sister's tree as well continues to survive, she did not take quite as much pride in hers as I did in mine, and actually forgot the sapling in her backpack for a week before dumping it unceremoniously in a corner of the garden. But, despite a rough start and many unoptimistic seasons, her little tree just won't die. It hasn't quite outgrown my sister yet though.